The group is interested in developing probes that can be used to study organelle formation and signaling (eukaryotic cells), and that can be used to identify novel targets for antibacterial agents. The design of these probes is based on natural products and inhibitors that have been shown to act in these pathways. Reactive groups and tags are incorporated to visualize the proteins that bind to the probe molecule. We recently employed this strategy to identify the targets of the natural product, Brabantamide A, in bacteria and we now have converted the most promising compounds into probes that can be used to label phospholipases. The recently awarded NWO-VIDI grant will be used to expand the activities in this research line. We aim to develop a panel of probes that can be used to study the role of all of the different phospholipase in bacteria and eukaryotic cells. Challenge in the field of chemical probe development is the synthesis of the probes and we will therefore also expand our efforts towards establishing novel methodologies that enable the synthesis of probe in a combinatorial fashion. Dr Witte has a long-standing interest in the development of methods that enable selective modification of biomolecules. Reagents that modify proteins of interest can be used both to study the function of the protein and to identify targets of small molecules. The challenge in the development of these reagents is attaining selectivity. The protein of interest should react exclusively, preferentially in a site-selective fashion, and the rest of the biomolecules should be left untouched. Furthermore, it should enable straightforward incorporation of multiple functional groups. To enable this, we pioneered the use of unprecedented targeted diazotransfer reagents and showed that not only purified proteins, but also proteins in complex mixture and on the cell surface can be modified with these reagents. As an application, we will use the targeted diazotransfer reagents for the development of probes that can be used label phospholipases. Together with Prof Minnaard, we started to develop methods that enable site-selective modification of oligosaccharides. Such methods are virtually lacking and we successfully developed a method that enables selective modification of glucose-configured residues within an oligosaccharide. 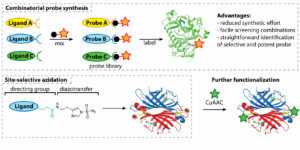 The development of protein labeling reagents in this line will be expanded in the coming years, funded by an NWO-VIDI and the research towards the selective modification glycans will be expanded funded by an NWO-TOP grant. With 39 publications, 754 citations, and h-index = 16, Witte is a recognized contributor to the respective fields.